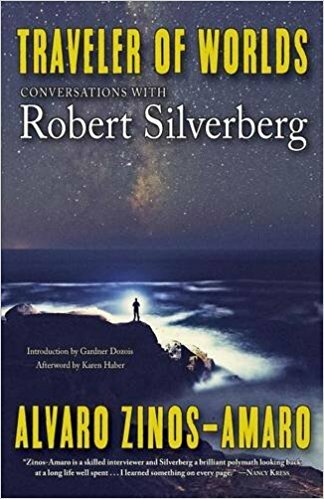 The important information on this book’s cover is the subtitle, Conversations with Robert Silverberg. 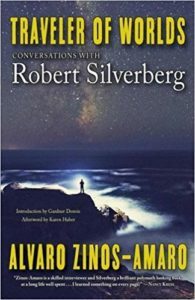 Traveler of Worlds is entirely a set of interviews with Silverberg, who recently passed 80 years of age. He’s one of the grand old men of science fiction; he has attended every Hugo award ceremony; he was incredibly prolific back in the day; and he is now very firmly retired. Over the course of a little more than 300 pages, Silverberg and Zinos-Amaro range across a wide variety of subjects, but concentrate on reading, writing, science fiction, and art. In science fiction fandom Silverberg is famed as a toastmaster, held to be an exceptional raconteur, and noted for welcoming even rank newcomers to the field. In his introduction to these conversations, Gardner Dozois (another grandee of the field) says, “Silverberg has always struck me as the most urbane of all the field’s practitioners” and praises his “his effortless urbanity, sophistication, and charm.” I found him congenial, but I was not blown away; perhaps I have been fortunate in my conversational partners. The conventional narrative of Silverberg’s career is that he started selling stories from an early age, was an enormously prolific hack through the middle or late 1960s, and then had an incredibly fertile period where his art reached an entirely new level. He retired for a time in the mid-1970s, then returned with a late period of strong work that gradually tapered off. It is safe to say that he has finished writing now; he refers to himself several times in the book as a former writer. It’s difficult to grasp just how prolific Silverberg was for a while. He mentions having a year when he sold two million words of writing. He was routinely writing, and selling, upwards of three thousand words per day. No complete bibliography of his work exists. It is possible that one could be constructed, but he wrote not only science fiction, but quite a bit of non-fiction, and nearly anything that someone asked him to write and would pay for. He wrote under a large number of pseudonyms. He wrote erotica at a time when that could earn a visit from the FBI for indecent use of the mail; he very carefully did not lie to the G-men when they dropped by, in part because they were inept with their questions. The consensus view on Silverberg was that he was a hack who suddenly, and a bit mysteriously, blossomed into a serious artist. I’ve read a number of books from this middle period — Nightwings, The Book of Skulls, The World Inside, probably several more though none in the last 20 years — and they’re extraordinary. They pushed the boundaries of what science fiction was then, and they’ve stayed with me, at least in part, years later. His own take on this change is interesting. When the market changed, when he had enough wherewithal that he could publish at a less than breakneck speed, he stretched out, and in doing so he also stretched what the genre could do. Even a big name like Silverberg sometimes fell victim to the follies of the business side of publishing, at least in his telling. He recounts how one of his 1980s books was supposed to be supported by tens of thousands of dollars’ worth of advertising. Publication day came and went; he kept looking for ads; no ads. The person he talked with at the publisher said they would have to look into it. The attachment of science fiction publishers to major media corporations has brought many changes, not all of them positive, but I rather suspect that something like that would not fall between the cracks today. I liked Silverberg most when he was talking about books and about writing. The benefits of a sixty-year career shine through. Zinos-Amaro would suggest a title or an author as a starting point, and Silverberg would rattle through half a dozen connections of more, pointing up links in disparate fields, or bringing up authors with great works that are now nearly forgotten. He has a long go at Thomas Hardy for writing ineffective prose, quite in contrast to his near contemporary Dickens. Silverberg also talks for a while about the achievements of Balzac and Zola, how they chronicled France, and how different parts of each author’s work relate to earlier or later items. Silverberg and Zinos-Amaro take Hemingway and Graham Greene as examples for beginnings, narrative hooks, and endings. I enjoyed listening in on those parts. I liked Silverberg least when he was talking about politics. He’s swallowed a lot of nonsense about Bill Clinton; he’s swallowed a fair amount of nonsense about Islam. I wanted to think better of him than what he shows on these and related topics. It’s a short section, though, and I hope that if I make it to 80, I will not have fallen for similar things. He shows a certain degree of get-off-my-lawnism in other topics as well. “But what I see being acclaimed in modern science fiction, such that I look at, doesn’t impress me with its breadth of historical reference. If you don’t understand the past it’s very hard to extrapolate the future. There is now, aside from the general ignorance which pervades our culture, a political condemnation of the past.” (p. 126) I think “being acclaimed” may be doing more work in that first sentence than should properly be asked of it. I halfway wish that Zinos-Amaro had pushed him to be more specific, but I can also understand Silverberg being reluctant to name names. The second point is that a lot of science fiction today is not about extrapolating any future, let alone “the” future. For that matter, a lot of science fiction wasn’t about extrapolation when Silverberg was at his peak. Third, “general ignorance which pervades our culture” depends on where you look and what you want to see; plenty of things point in the other direction as well, and neither of these conditions is necessarily all that different from when Silverberg was a younger man. I guess this get filed under Old Guy is Cranky, along with a note to myself that in a few decades I should remember and not be that guy. * The only de Quincey I’ve read is Confessions of an English Opium-Eater, which wasn’t as trippy as I wanted it to be. * Zinos-Amaro: Frazer’s Golden Bough. Silverberg: You don’t read that, you just sort of explore it. I have the abridged one-volume edition which I’ve dipped into now and again. Congenial conversations with Robert Silverberg. I enjoyed hearing first-hand about the practice of science fiction and how the field has evolved, from his perspective. The digressions were generally interesting, and reading about other books and stories was good fun. I’m glad to have spent the afternoon or so it took to take this in. Traveler of Worlds is the ninth bit of Hugo reading I have done this year, and the sixth I have written about.